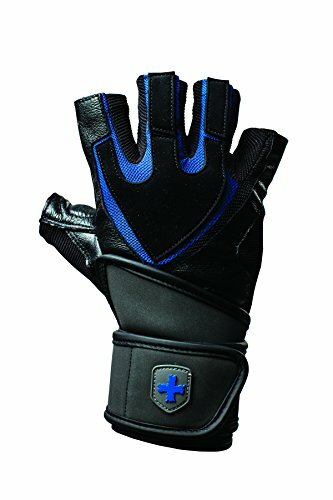 I’m putting together the best weight lifting gloves with wrist support for men that are padded in 2018, compiled all into one article so that you don’t have to go searching each individual item. 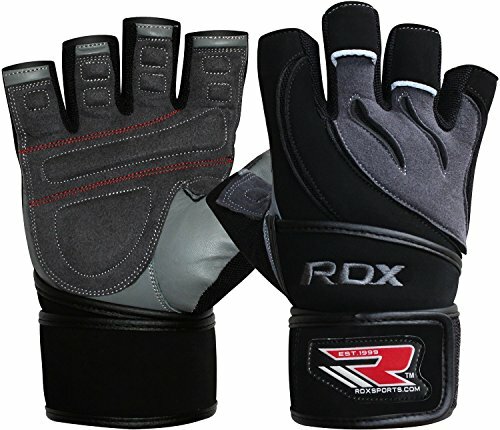 We’ll be focusing on these gloves: RDX Leather Men’s Gym Gloves Vs 2016 Evo 2 Weightlifting Gloves Vs RIMSports’ Weightlifting Gloves Vs Trideer Weight Lifting Gloves Vs Harbinger Training Grip Weightlifting Gloves Vs Steel Sweat Weightlifting Gloves Vs US Muscle Division Weight Lifting Gloves. Weight lifting gloves have come a long way here lately with different designs and features. Now there really isn’t a “all are pretty much the same so just pick one” type of situation, some are much better than others. The RDX Leather Men’s Gym Weight Lifting Gloves are some of the best looking gloves I’ve ever seen. I wanted to buy them just because of how good they looked but that would be a dumb way to go about getting a good pair. Getting away from the looks these gloves are made from durable authentic NAPPA cowhide leather. The palm comes with padding provides help with shock absorbance help and helps really helps with weights sit great in your hands. They also come with a really long velcro wrist strap that when it’s fastened up provides great wrist support for when you’re lifting. 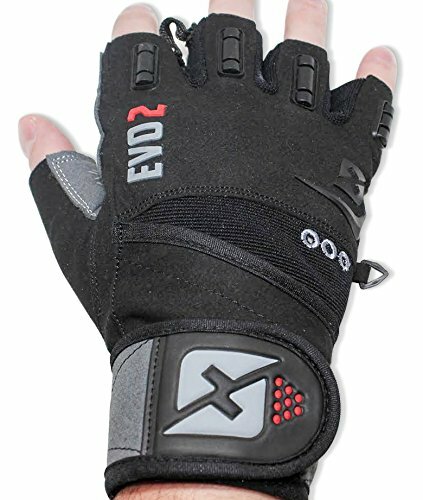 The 2016 Evo 2 Weightlifting Gloves take our second top pick for the quality and features that it comes with, also they actually look pretty good in my opinion. These gloves come with fully built it wrist wraps for great wrist support and also comes with soft yet durable lining of the gloves. Another great feature these offer is gel printed palms to prevent the slippage and injuries which definitely comes in handy. These are a unisex design so men and women can use them, so if your wife/gf likes how them you should pick her a pair up. 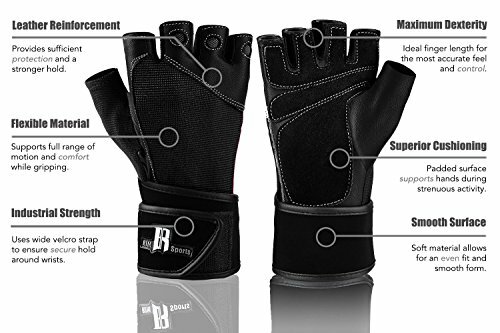 The RIMSports’ Weightlifting Gloves have a unique type of build to them with a softer top outer area of the gloves with the cushioned more durable area on the bottom where your hands actually meet the weights. This is a great design that gives you a more relaxed type of feel on your hands overall. The palm area provides a great cushioned setup which gives a great grip feeling when lifting. The wrist strap provides good firm wrist support which is a must have for me. 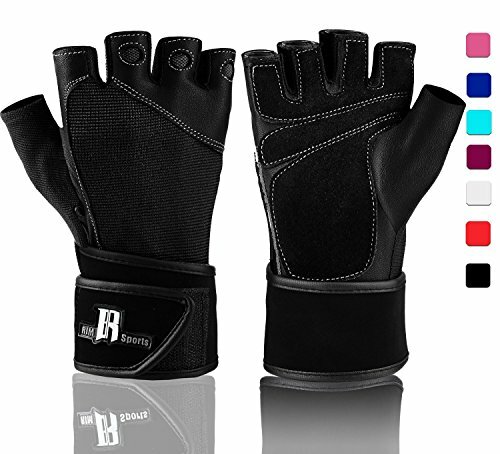 Another great thing here is the selection, you can get these gloves in 7 different colors. 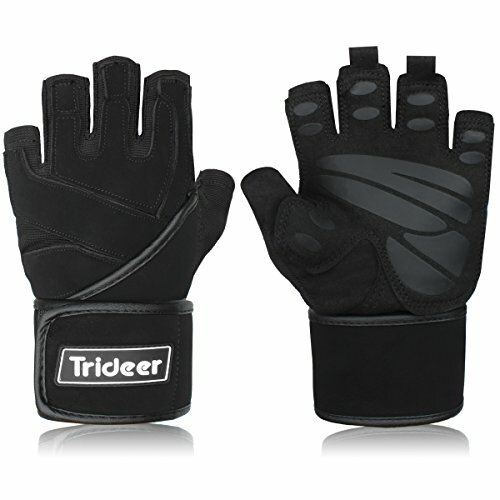 The Trideer Weight Lifting Gloves are great multipurpose gloves that work great for fitness activities. These gloves aren’t wowing to look at with a basic design that comes in the color black all over. They do come with some great features however that help make these gloves as some of the best on the market. These gloves come with padded palms for extra comfort when gripping the weights and silica gel pads to help provide friction for better overall grasp. It comes with breathable material that is double stitched which helps from preventing it from getting wear & tear easy. You also get a long 18” wrist wrap that is built into the glove for excellent wrist support. The Harbinger Training Grip Weightlifting Gloves are a great pair of lifting gloves brought to you by one of the best names in the industry. These gloves come with integrated wrist wraps to stabilize wrist joints for support and a “TechGel” padding which helps with comfort and grip support. The outer part of the gloves comes great breathable material which helps with your hands not getting hot/sweaty. I’m not overly crazy about the looks of these gloves but aside from the looks these are fantastic gloves for using in the gym. 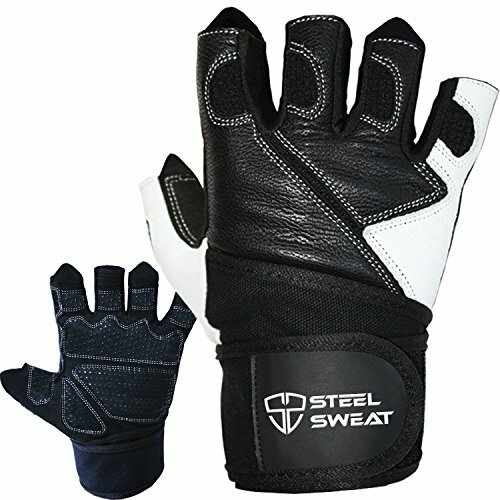 The Steel Sweat Weightlifting Gloves are some of the newest to add to my arsenal of gloves for when I hit the gym. They come with padded palms and grip dots which assist with comfort and keeping a strong grip on the bars/handles. 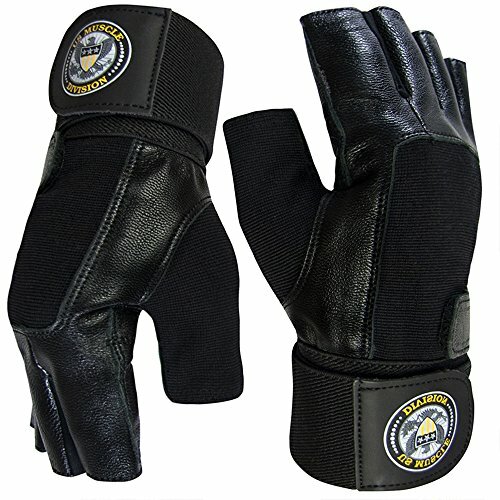 It comes with double stitching and real leather on the back half of the gloves which makes for strong and durable gloves. They also come with wrists wraps already made into them which assists with overall wrist support. The US Muscle Division Weight Lifting Gloves make our list because they cover a lot of the features you see from other gloves on this list but at a lower price. These gloves come with padding to primary grip points and easy breathe stretchable mesh Lycra on back of hand. It’s double stitched to help it last as long as possible. You also get wrap around wrist support built into the glove, which is a must for me when buying gloves. Main thing I wish these gloves had was some sort of grip assistance on them. As you can see you do get a lot of great features from this glove but without anything major looks wise which is perfect for a lot of people who could care less what their gloves look like as long as they do their job. I feel very confident that any gloves on this list will be a good pick for you. However, if you’re very picky about which gloves you are getting (like myself) then take time to read some reviews on the product over at amazon to see what others think about them or ask people at the gym if you see them wearing gloves. There are weight lifting gloves that do come without wrist support but I personally find it to be such a crucial part to the gloves that all of the gloves I recommended on this list do come with wrist support. You can always purchase them from local sporting goods stores like Academy or Dicks Sporting Goods but I have no idea what selection each one will have. I prefer to buy my weight lifting gloves off of Amazon because they usually have a much bigger selection for me to choose from. Other than that you can check out some online weightlifting sites like bodybuilding.com and sites like that to see what they have.